In yesterdays post I taked about some updates to the ShaderLib to allow registering of the uniforms, and as I was driving into work I decided to add some more code to parse the shader source and look for any lines containing the word uniform and automatically add it to the uniforms list. The simple case of a single uniform is easy to parse and can be accomplished by reading the shader source and looking for lines containing the uniform keyword. The array version however is more complex as we need to determine if we have one of two different cases. Either a hard coded array value or a constant defined by a #define statement. The lucky thing is that the #define must always be executed before it is used, so we can store these values and do a lookup on them. The downside of this is the fact that each element of the array must be registered. This is further compounded by the fact that the data type may be a structure. I'm not going to worry about the structure side of things and only worry with accessing normal arrays of the type uniform vec3 points for example. In general C++ string processing is not that good, however there are several really good libraries in boost that allow loads of different string processing. For this example I'm going to use boost::tokenizer ,boost::format, boost::split and boost::lexical_cast, all of these are header only templated classes so don't require external compiled libs and all work well with the usual stl containers. I've created a new method for the ShaderProgram class which will loop for each attached shader and grab the shader source code string (the whole shader is stored as a single std::string ) this is then split based on the tokens \n\r and a space. Each line is then searched to find the following keywords "uniform" and "#define". The code to do this is as follows. To find if the string contains our keywords we use the std::string find method which will return a value not equal to std::string::npos if found (basically the index but we don't need that). If this is found we can process the respective values. 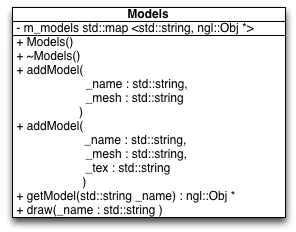 To store any #define values I'm going to use a std::map<std::string, int> to store the value, and also make the assumption that we will always have the form #define name [int]. This is a very safe assumption as array subscripts must always be positive and in the case of glsl most implementations only allow very small arrays. You will notice that the boost::lexical_cast is used to convert the string into an integer, and that both the values are returned to the main program and stored in the defines map ready to be passed into the next function to process the uniforms. Most of the code is similar to the other parse methods, however we use the fact that boost::lexical_cast throws and exception to check to see if we have a number or a string as the size of the array, first I try the cast, if this throws a boost::bad_lexical_cast exception we look to see if we have the value stored in our defines list. This works quite well and is fairly robust (as the glsl compiler will fail if the code is wrong anyway), however as mentioned above it doesn't cope with registering uniforms which have structures. I may refine this at a later date to cope with these but it would require storing each structure and element of that structure and registering each element. 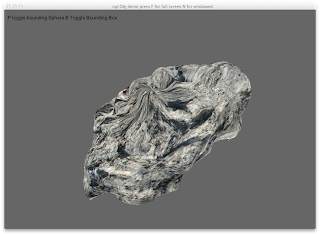 This will eventually be made redundant due to the use of the new glsl Uniform Buffer Objects however at present my mac doesn't support them so will have to wait. 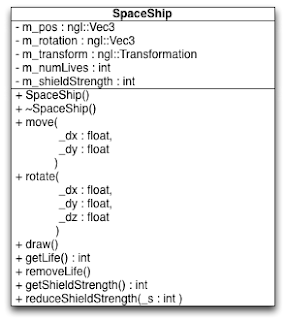 This code has been integrated into ngl and the latest source tree has been updated to inclue it all. Just a quick post to explain some updates to the ngl::ShaderLib sub-system. First of all this doesn't break any existing code, but has in some situations increased frame rate by 10-15%. First a bit of background, all of the shader lib functions use the getUniformLocation function to query the location of the uniform in the current program and use this GLuint offset to load the values to the uniform in the shader. This will register the uniforms, now when we load the matrix values to the shaders, we can use the "registered" versions of the functions which will look up the values in the map and use the uniform's stored there. This will work unless the shader source is changed and re-compiled. In that case they will need to be re-registered. We get the following compiler error error: no match for 'operator*' in '2 * a' This is due to the fact that we have no operator for scalar * Vec3. To solve this problem we can generate a Free function version of the operator and a scale method to scale the vector by a scalar value. In the previous post we looked at the mandated member operators, for this part I'm going to look at the different types of operators we can generate and provide examples of each. These operators will always return a boolean value which will be the result of some form of comparison. 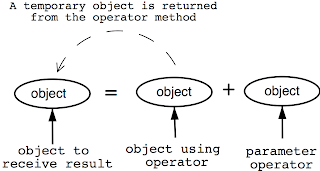 Arithmetic operators will return an object of some type which depending upon the context may be either the same object or a new type of object. Later we will also add the += style operators which will mutate the current object rather than returning a value. In the case of the Vec3 class there are only two equality operator which make sense to implement, these are the == and != operators. Also we must ensure that we are doing correct comparison as we are storing floating point values. 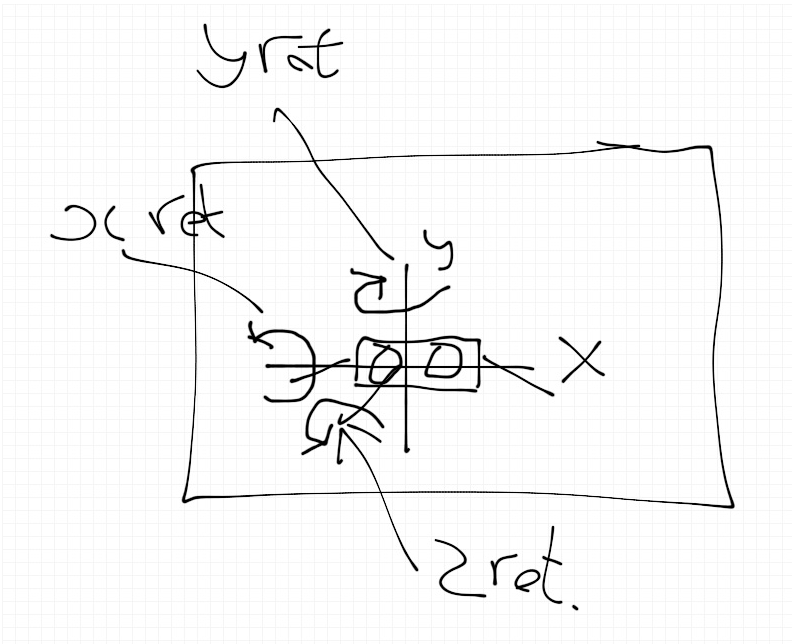 ( see here for an in depth discussion of floating point comparison ). For this example I'm going to generate a very simple FCompare macro which will be used to do a comparison via a simple epsilon error value. 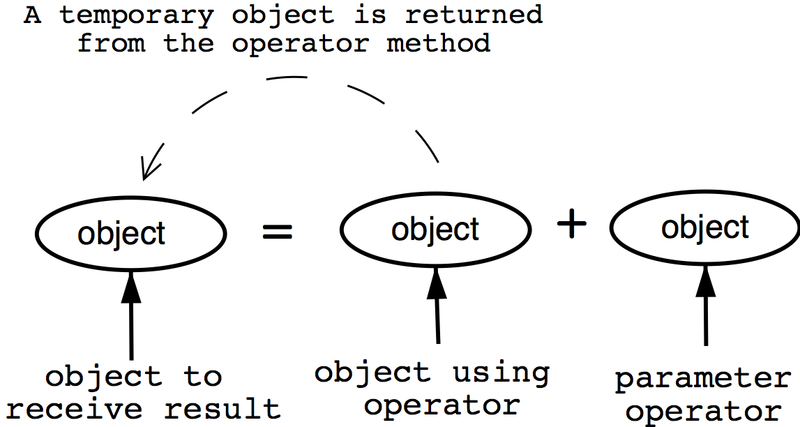 In the previous post I discussed some of the basics of operator overloading and the difference between "Free Operators" and "Member Operators" and we overloaded the << insertion operator so we could use our Vec3 class with the std::cout method, in this section I'm going to start with the assignment operator which is one of the operators which must be a Member operator. The assignment operator must be a member operator to ensure that they receive an lvalue (basically an expression that refers to the object) as the first operand, also if we follow the "rule of three" we should define a copy constructor as well, in this case we could get away without writing an assignment operator as we don't create any dynamic memory in the class, however good practice dictates it's best to always do this. If we did any dynamic allocation in this class we would need to do a "deep copy". The following code is added to both version of the project code to add the copy constructor and assignment operator. The  subscript operator is a useful operator to overload as it will allow assignment and access to the internal elements of the class. This does however have the side effect of exposing these private attributes and break encapsulation. Assertion failed: (_index<3), function operator, file Vec3.cpp, line 42. Whilst this will work it does make several assumptions on how the data is packed in your header,in this case we assume packed alignment and that m_x m_y and m_z are contiguous, while this is generally the case it is not the safest way of accessing the data and the union should always ensue that the correct data packing is in place. We introduced the concept of operator overloading today in the first year lecture / lab session and there was quite a lot of confusion, so I've decided to do a more in depth article about it here. There is a wealth of knowledge online about operator overloading and a good starting point is this article as well as the venerable c++ faq, however I'm going to use the excellent book by Martin Reddy "API Design for C++" as he discusses some interesting differences between the ways we can implement Operator Overloading. But that is almost unreadable and the actual mathematic being implemented is $$ a*b+c*d+a*c $$ which is much more readable, and when trying to implement a mathematical function from a paper much easier to check when debugging. So we can use operator overloading to make our classes work like mathematical data types even when they are not. However, it is important to only overload operators which seem natural to do so and follow the semantic you would expect. For example it is natural to overload the plus + operator to meen addition or for string based objects concatenation. In the above example we construct a Vec3 a and assign it some values, and be will be constructed using the default parameter values 0,0,0. By default the compiler will implement a simple assignment operator for us and a==b. (don't worry we will create our own soon). Reddy defines two different types of operator, "Free Operators" and "Member Operators" Member operators are members of the class, and as such have full access to the private data areas of the class, there are some operators that can only be implemented using Member Operators ( =  -> ->* () (T) new / delete) however all the other operators can be implemented in both ways. In this example I'm going to implement both type using two different project files (which can be downloaded from the link at the top of the page). Free Operators are not part of the class, and are declared as functions separate to the class, this means that the function doesn't have access to the class private data area so we must write some form of accesors for the attributes for it to work, however this does have the advantage of allow us to reduce the coupling of the Vec3 class to our other implementation. The other advantage of Free Operators is that they give us better symmetry and allow us to do something like 2*V and V*2 in the same code. The first operator I'm going to implement is the << insertion operator, this will allow us to use std::cout to print the contents of our class, this is perhaps not the best one to start with as it actually add extra complication to what we are doing as we need to send data to the std::ostream class and it will need to know about the internal structure of our Vec3 class. The easiest way of doing this, and in most texts the way shown, is by using the friend prefix this indicates that the method is a friend of the class and it can access the private data. This does however break encapsulation and promotes many coding arguments. The client program to use the operator will be exactly the same. In the previous pos I got the ship moving, and on the way to work I decided it would be good to make a better background to the game, so I created a very simple StarMap class which loads two textures and creates two rotating sphere with alpha blended textures. This is shown in the following video and I will write a more detailed explanation when I get a chance. I've also got a new model form Turbo Squid until I get a better one. 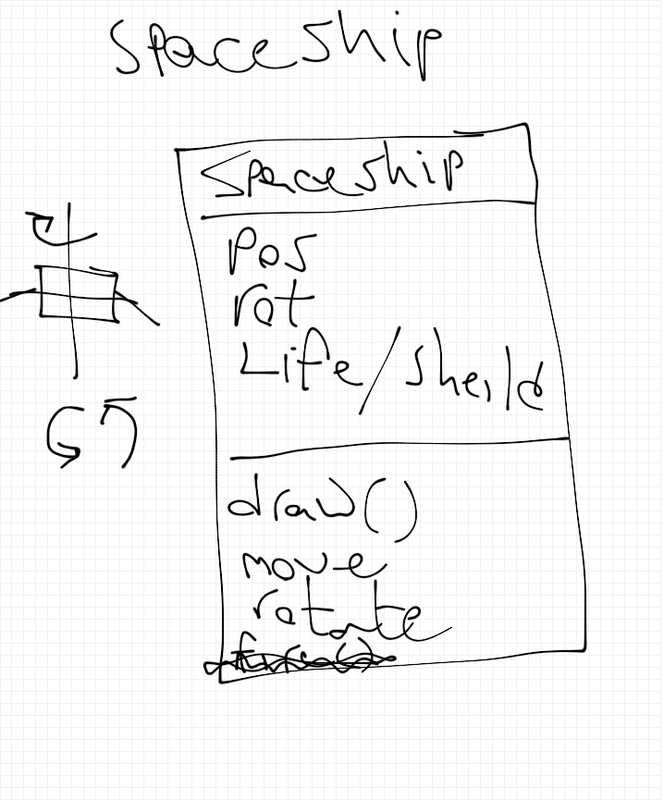 // motion of a spaceship for a given key combo. 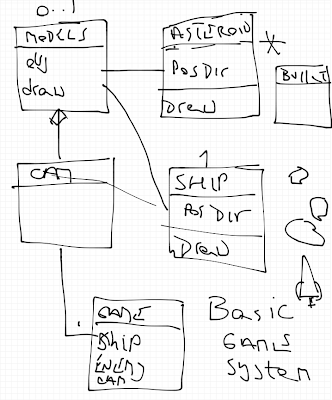 In the previous post I created a simple SpaceShip class, to contain the state data for the Ship, I also outlined different methods. In this post I'm going to discuss different ways of associating the classes with each other. 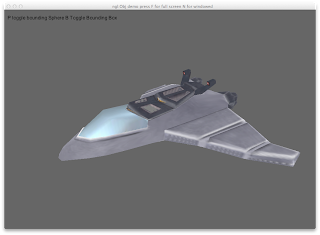 In this case we have the SpaceShip class which contains the state data, and the Models class which will contain the actual Mesh to be draw. I'm going to then highlight three different ways of associating the classes so the SpaceShip class can access the model and draw. 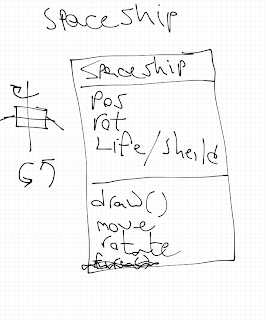 In all these version we will have an instance of the SpaceShip class created in the GLWindow class called m_spaceShip, and we need to pass the global ngl::Camera to the SpaceShip class as well as the instance of the Model class. You will now note that this method is no longer marked as const, this is because in the loadMatricesToShader method we need to access the m_transform object and grab the current matrix. This will force the transform object to calculate the transforms and mutate itself, and hence is now a non const method. As you can see the orientation is wrong at present but I will fix that later. The next version is going to have two global pointers one for the Camera and one for the Models, these will be set in the spaceship class on construction and then used in the draw methods. We now need to set these value, the best way to do this is by using the constructor, as we can guarantee that this will always be called. 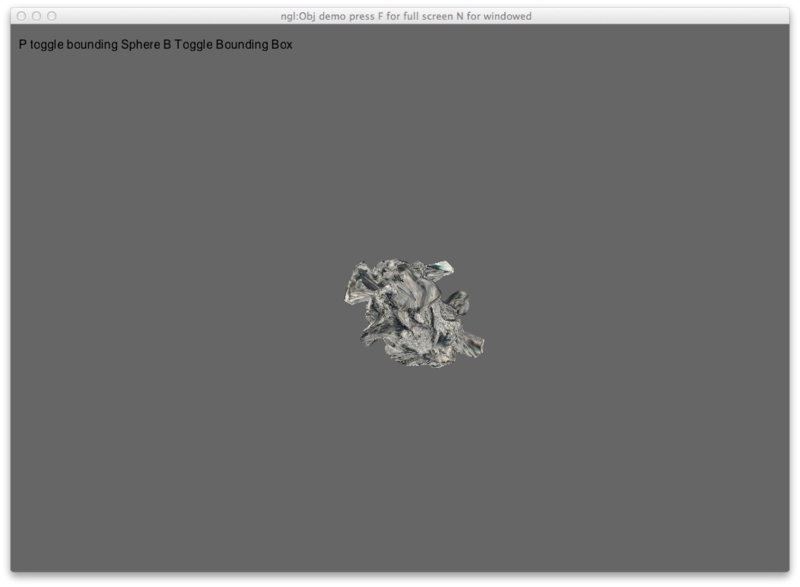 The final method I'm going to describe is going to use a global game object. This object will be a singleton class, it will have public attributes for the camera and the models, which must be set when the class is first used. The SpaceShip class will then access this when required. if (m_instance == 0)  // is it the first call? As you can see this method breaks some of the OO rules about encapsulation but will require less re-working of the code if we wish to change game elements or add / remove elements to be shared with the rest of the game objects. Another speed test puts this at about the same speed as the others. So there is no clear winner at present for any of the methods. All of the code for the three examples can be found here, for now I think I'm going to use the GlobalGame object method as it will make the development cycle quicker as I only need to add things to the singleton class. The main premise of the game is we are going to have a read view of a SpaceShip which the player can move around the screen in x and y. 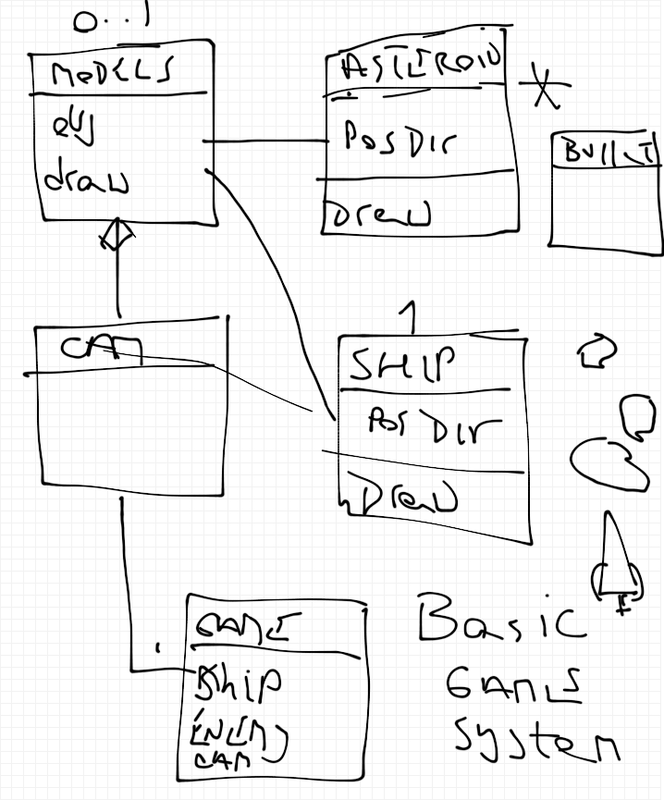 The user can also rotate the ship around the different axis. By default the player will have 3 ships which will be decreased based on gameplay / collisions and there will be opportunities to add more ships based on score etc. It's programming assignment time again, and I've decided this year to write a simple game to demonstrate some of the features of NGL and to show you how to go from the initial design stuff into code. For this game I've decided to do a simple 3D style asteroid game which uses a number of obj meshes to draw the different asteroids and the ship. The main focus on these blog posts will be the sharing of data across different classes and the stepwise refinement from the class design to writing the code. I'm going to concentrate of the basic design of each of these classes, then implement and test them separately. The first class will be the models class. The models class is a container for the meshes, and allows us to share meshes for each of the other classes. For example in this game we will have a number of Asteroid objects, however each one will only have a single mesh. 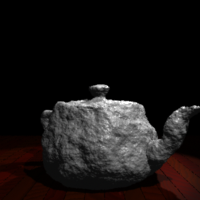 We could load a mesh for each Asteroid object we create, however this is going to be slow and wasteful of resources as we only have a limited amount of GPU memory and texture memory. 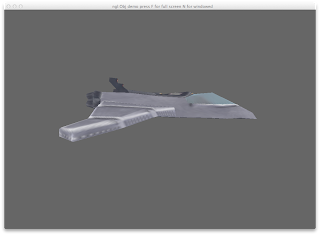 Using the Models class we load all our models and textures at program startup, then each of our classes that need access to the models will have a pointer to this class and access models via it. To store the Obj meshes I decided to use std::string name lookup and the easiest way of implementing this is to use the std::map container and use the build in iterators to access things. Another concern when designing is to ensue we have const correctness built in from the outset. 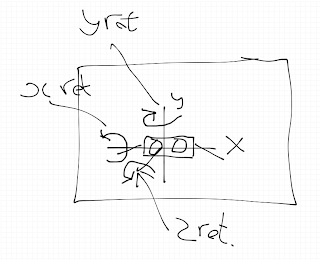 In this case as we only have one method that doesn't mutate the class (the draw method) it is quite easy to do this. As you can see the constructor doesn't do anything in the class, however we need to implement a destructor to call the ngl::Obj destructor and clear out all the mesh data etc. To test the class I've used one of the basic ngl:: demo programs, and added to the GLWindow.h class a simple Models m_model; object. It has occurred to me, whilst writing this up that using a std::map may not be the fasted way of using this class as we need to iterate to search by name. It may actually be better to use a std::vector and have some form of index based enumerated type to search for the models. Once I start testing the rest of the classes I will do some comparisons for speed, which will test this.